Schematic of the experimental setup for high-order harmonic generation measurement. Top panel: One femtosecond laser beam is used to irradiate the polished fused silica surface at an incidence angle of 15°. The radiations at specular direction are measured by a flat-field spectrometer. Bottom panel: Raw image of the harmonic spectrum. Harmonics up to the 21st order are obtained from the glass target with a plasma mirror. Generation of light pulses with shorter duration for diagnosing and controlling the ultrafast processes in microcosm has been a subject of strong scientific interest. Femtosecond laser pulses can be extensively produced by the self-mode locking technique, which make it achievable to make the “slow movie” of atoms in chemical reactions and to research the chemical bond breaking and forming processes at atomic level. To further investigate the electron movement inside atoms, a flash light in attosecond (10-18 s) time scale becomes necessary. Since the light duration could not be shorter than an optical period, attosecond pulses can only be generated in the region of extreme ultraviolet or even X-ray. Up to now, the most successful method to produce attosecond pulses is based on the high-order harmonic generation (HOHG) through the interactions of ultrashort intense laser beams with gases, which has generated light pulses shorter than 100 as. However, limited by the gas ionization threshold, the intensities of driving laser cannot be above 1015 W/cm2. On the other hand, recent theoretical and experimental researches have demonstrated that the HOHG from the plasma surfaces has no limitation on laser intensities, which makes it hopeful to generate more intense and shorter coherent pulses. So far, two basic mechanisms of HOHG from plasma surfaces have been clearly identified by the laser intensities, coherent wake emission (CWE) and relativistically oscillating mirror (ROM). At moderate laser intensities (>1015 W/cm2), the CWE mechanism dominates the radiation. In this scenario, the surface electrons are first pulled out of plasma and gain energy by the laser electric field. When the sign of electric field reverses, these electrons will be re-injected into the plasma and excite plasma waves. If there is an electron density gradient in front of the target, high-order harmonics can be effectively generated by the linear mode conversion of plasma waves. When the laser reaches the relativistic intensities (>1018 W/cm2), the ROM mechanism becomes dominant. The plasma surface will oscillate periodically at nearly the speed of light driven by the laser. As the incident laser is reflected by the oscillating surface, high-order harmonics are generated by the Doppler frequency shift. The HOHG is not only dependent on the laser intensities, but also influenced by the density profile of preplasma induced by the front of laser pulse. Using the 200 TW laser facility at Laboratory for Laser Plasmas at Shanghai Jiao Tong University, the research team led by Prof. Zhang Jie and Prof. Liu Feng has investigated the effect of laser temporal contrast on the HOHG from solid targets. To obtain a steep density gradient in front of targets, a single plasma mirror (PM) system had been set up to enhance the laser temporal contrast from 10-8 to 10-10 at 10 ps prior to the main peak. Harmonics up to the 21st order are generated by this scheme. This work is published in Chinese Optics Letters, Volume 15, No. 8, 2017 (Jian Gao, et al., Influence of laser contrast on high-order harmonic generation from solid-density plasma surface). 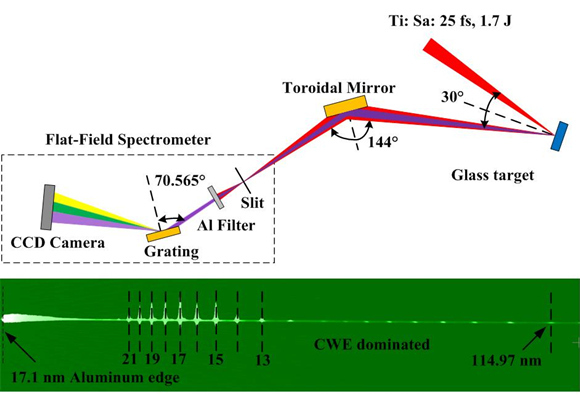 The femtosecond laser beam with peak intensity of 3.5×1019 W/cm2 was used in the experiment to irradiate the polished fused silica surface at an incidence angle of 15°. The radiations at specular direction were measured by a flat-field spectrometer. CWE harmonics up to the 21st order are observed only when high contrast laser pulses are used by applying the PM. No harmonics but only plasma emission is obtained when PM is not used. The density scale length of preplasma is crucial to the HOHG from the surface of solid target. 2D particle-in-cell (PIC) has been employed to simulate the dependence of high harmonic intensities on the density scale lengths. The team finds that there is an optimum length which corresponds to the maximum high harmonic intensity. The research on this effect is useful to understand the underlying physics and optimize the experimental conditions. The results will help to obtain coherent and ultrashort pulses with higher intensities in the future. Only CWE harmonics have been observed in the experiment. ROM harmonics could generate radiations with shorter wavelength and narrower pulse duration，which is very important for many applications. Both the laser intensities and plasma density gradient in the experiment should be able to generate ROM harmonics. Following experiment will try to change the incidence angle of laser to investigate its impact on the HOHG and obtain ROM harmonics. In the future, it is possible to realize coherent diffraction imaging experiment by picking up a single harmonic pulse.